Macron became the first French president to address the Bundestag in 18 years today. FRENCH PRESIDENT EMMANUEL Macron today urged a Franco-German push to make Europe a stronger and more confident global player that could prevent “chaos” on the world stage. Macron and German Chancellor Angela Merkel have used a series of war anniversaries to project unity as they push back against populist and nationalist forces in Europe and Trump’s isolationist “America First” stance. With half a year until European Parliament elections in which far-right forces look to make gains, Macron made a passionate plea for stronger backing from Merkel on a range of reforms to strengthen Europe. 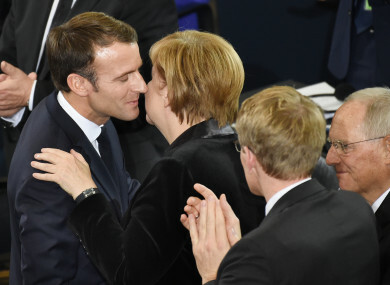 “Europe, and within it the Franco-German couple, have the obligation not to let the world slip into chaos and to guide it on the road to peace,” Macron told the German parliament. “That’s why Europe must be stronger… and win more sovereignty,” he said at a ceremony to honour the victims of past wars and dictatorships. Macron said it was Europe that had led the drive for green energy and against climate change and was now most strongly pushing multilateral approaches to trade, security, migration and environmental policy. The first French president to address the Bundestag in 18 years, Macron called for greater European unity in order for the bloc to meet future challenges in an uncertain world. He said Europe must not “become a plaything of great powers, must assume greater responsibility for its security and its defence, and must not accept a subordinate role in world politics”. Merkel said she agreed with Macron’s assessment that Europe stands “at a crossroads”, before the two headed into a meeting to discuss a range of policy challenges — from a joint eurozone budget to migration policy and taxing Internet giants. The German leader reiterated that she backed Macron’s proposal for a future European army as a symbol of a united continent — an idea that has raised Trump’s hackles. But German Defence Minister Ursula von der Leyen insisted today that a joint military force would need not just common equipment and training but also “the political will to resolutely defend European interests when a conflict breaks out”. And France’s Minister for European Affairs, Nathalie Loiseau, told the Journal du Dimanche “it is not a question of being against the United States but of taking our destiny into our own hands to no longer count on others”. Macron’s Berlin visit came a week after world leaders met in Paris to commemorate the end of World War I a century ago. Macron has repeatedly invoked the war’s horrors to drive home the message that rising nationalism is again destabilising the world. In a Berlin meeting with youths, Macron warned that forgetting history means “to repeat the mistakes of the past”. While strong on symbolism, the Franco-German partnership and European reform push have been plagued by policy differences and the domestic troubles of the two leaders. Since a Franco-German joint cabinet meeting on Europe in June, challenges have piled up with Brexit nearing and a budget conflict escalating between Brussels and Italy. Macron also addressed German hesitation on major reforms such as a large common budget for the eurozone, saying that “this new stage is scary”. The meeting came as both leaders are politically weakened, reducing the traditional driving power at the heart of the bloc. As Trump gleefully tweeted days ago, Macron’s once stellar approval ratings have dropped off into the mid-twenties. He now faces a wave of protests over high fuel prices by so-called “yellow vest” demonstrators who charge that Macron, a former investment banker, is neglecting the lower and middle classes. And Merkel, after 13 years in power, recently announced the beginning of the end of her reign by declining to stand again as leader of her centre-right Christian Democrats (CDU). She has vowed to serve out her fourth term, which runs until 2021, but many observers expect Merkel could be brought down earlier by infighting within the CDU or the unhappy three-party coalition she leads. Email “Macron issues plea to Merkel for stronger Europe to help prevent world 'slipping into chaos'”. Feedback on “Macron issues plea to Merkel for stronger Europe to help prevent world 'slipping into chaos'”.